Great gift idea: A baby Century Tree! Andy Duffie, ’78, (our meeting speaker October 10, 2017) is growing and selling Century Tree seedlings as an A&M scholarship fundraiser. He has already funded a President’s Endowed Scholarship (2012), an Aggie Ring Scholarship (2015), and is now working on a Sul Ross Scholarship for the Corps of Cadets. He sells the seedlings from his web site (aggiecenturyproject.com) for $100 each. The little trees are 16- to 24-inches tall, depending upon the time of year (shorter in winter months, taller by late summer). 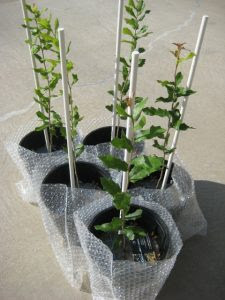 They are one year old, in excellent condition, and are planted in one-gallon containers. Customers have the option of picking up a seedling from his home in College Station or he will package and ship a seedling by UPS to any location across the southern U.S. (where live oaks grow) for an extra $20. For every referred customer sent by our club, he sends us $20. For us to get credit, during the online purchase a pop-up box will appear asking the customer “How did you learn of the Aggie Century Tree Project?” The customer simply enters Austin Texas A&M Mothers Club in that field – which is captured as part of the transaction.